Are you looking for romantic hotels in Michigan, USA for unforgettable romantic getaways and vacations, or for a memorable wedding and a honeymoon? 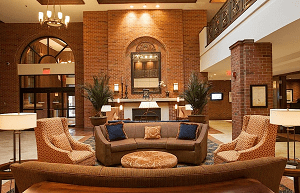 Here are some of the best Michigan hotels with spa, pool, sauna, whirlpool, in-room dining, great restaurants, fitness center, luxurious rooms and meeting facilities, romantic packages, high-speed wireless internet, full-service concierge, and much more. Romantic hotels in Michigan, USA. Ideas for romantic getaways for couples. The Henry provides an ideal Detroit area location adjacent to Fairlane Town Center shopping mall, 1 mile to Ford Motor Company world headquarters, and less than 3 miles to The Henry Ford Museum and Greenfield Village. 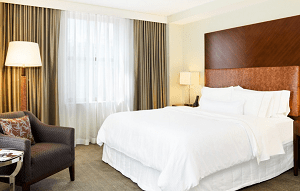 The hotel rooms and suites offer boldly luxurious living spaces, high tech accents, custom furnishings such as The Henry Bed, high-speed wired & wireless Internet access, a safe, refrigerator, work desk, cordless speakerphone and more. Some of the hotel amenities are: An American Brasserie, a 24 hour business center, indoor swimming pool & wirlpool, 24 hour fitness center, massage treatment rooms, an unmatched gallery style art collection, elegant events space for conferences, meetings, gala celebrations, and luxury weddings. The hotels also provides special Michigan Romantic Getaway Packages. 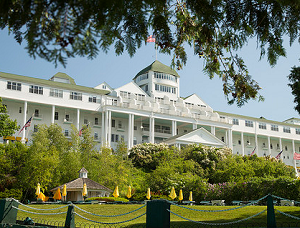 One of the best and most romantic hotels in Michigan for memorable weddings, honeymoons or Michigan romantic getaways. 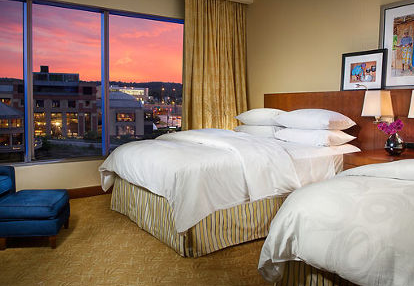 Situated in the heart of downtown Grand Rapids, Michigan, the JW Marriott Grand Rapids is one of the most romantic hotels in Michigan for memorable romantic getaways and vacations. The hotel offers well-appointed, smoke-free rooms and suites on 23 posh floors. Each of which is outfitted with atypical amenities like a 37″ plasma TV, as well as numerous other uncommon personal luxuries. From shareholder’s meetings to lavish wedding receptions to intimate weekend getaways to The Spa, the JW raises the bar. In luxury. In service. In dining. In everything. Some of the hotel amenities are: Fitness Center, Pool, Full Service Spa, Whirlpool, On-site parking, Valet parking, Wireless, and more. 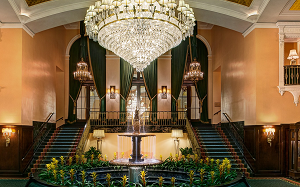 This luxury hotel returns legendary style and glamour to Detroit hotels. Now included in the National Register of Historic Places, the Italian Renaissance–style hotel, built by Detroit’s famous Book brothers, was the tallest building in Detroit and one of the best and most romantic hotels in Michigan. All of the uniquely appointed guestrooms and suites, offer sweeping views of the Detroit River or the city skyline. Rooms are extraordinarily spacious —averaging 475 square feet—and showcase rich fabrics and textures. The hotel’s facilities and services include a Michael Symon’s ROAST Restaurant, full-service business center, a sundries retail shop, a lobby bar, 24-hour in-room dining, an ATM, valet and self-parking, Service Express®, the Westin Kids Club®, concierge services, great wedding facilities and more. One of the best and most romantic hotels in Michigan for unforgettable romantic getaways. 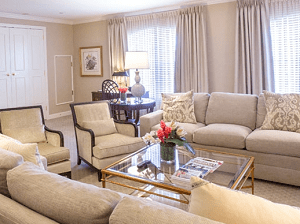 The Townsend Hotel, located in the heart of the walkable downtown community and upscale shopping district of Birmingham, Mich., is a four-diamond, four-star luxury hotel. The hotel has been provides world-class service for luxurious Michigan romantic getaways, special events or business conferences. The property’s rooms and suites include Egyptian cotton sheets, custom Italian-made duvet covers, marble baths with deep soaking tubs and Gilchrist & Soames spa products. Some of the hotel amenities are: a lobby with traditional English décor, marble fireplaces, 1,100-square-foot fitness facility, a number of superior meeting and event facilities, a state-of-the-art business center, and more. One of the greatest romantic hotels in Michigan for memorable weddings. 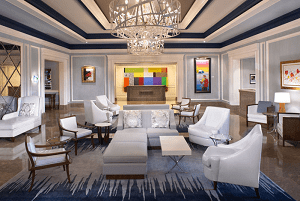 Amway Grand Plaza Hotel is one of the best and most romantic hotels in Michigan, a great location for unforgettable weddings, honeymoons or just for Michigan romantic weekend getaways. Warm, residentially styled guest rooms are designed with the modern-day traveler in mind – without sacrificing the traditional touches of luxury that make every room distinctively delightful. Some of the hotel amenities are: 24-hour in-room dining, Full-service concierge, Safety deposit boxes, Valet and self-parking, as well as oversized vehicle parking, Spa and salon, pool, sauna, spectacular restaurants, Shoeshine services, available in the lobby and more. The hotel also offers great romantic packages. Located in the upscale Metro Detroit suburb of Plymouth, MI. This breathtaking landmark is the premier location for luxury hotel accommodations, gourmet restaurant dining, corporate meetings & events, weddings, receptions, executive meetings, charity galas, special events and golf outings and is one of the most romantic hotels in Michigan. Some of the amenities are: Classic Romanesque architecture, marble floors, handcrafted woodwork and majestic stonework, tastefully appointed and elegant guest rooms, Breathtaking gardens and grounds, Challenging 27-hole golf course, Beautiful ballrooms and conference rooms, 5ive Restaurant. One of the best, most spectacular and most romantic hotels in Michigan and in USA for truly romantic getaways and escapes. At Grand Hotel, no two of the guest rooms are alike. More than three dozen themed Named Rooms and Suites–from the Lincoln Suite to the Hollywood Suite–make for interesting accommodations throughout. A number of dining options are available, from the legendary Main Dining Room—which overlooks the Straits of Mackinac to the more casual The Gate House, The Jockey Club at the Grand Stand, Cawthorne’s Village Inn and Carleton’s Tea Store. Grand Hotel is a spectacular locale for the celebration of weddings, honeymoons, anniversaries, family reunions and class reunions. See also some of the most romantic getaways in USA and World romantic spa getaways for couples.